The size of SSDs are ramping up at a dizzying pace, and Samsung is intensifying the race with its highest-capacity 32TB SSD. Samsung's SSD -- which will ship next year -- has just over twice the capacity of the company's PM1663a SSD, which shipped in March. The 32TB SSD doesn't match the capacity of Seagate's recently announced 60TB drive, but it is denser. The drives are being shown at the Flash Memory Summit in Santa Clara, California, this week. Samsung's SSD can fit in smaller 2.5-inch slots, while Seagate's 60TB drive fits in 3.5-inch slots. Samsung could have made a higher capacity SSD for 3.5-inch slots, but the company backs the smaller drive slots. SSD makers are packing more terabytes in drives because of storage demanded by applications like virtual reality, high-definition video, machine learning, and analytics. 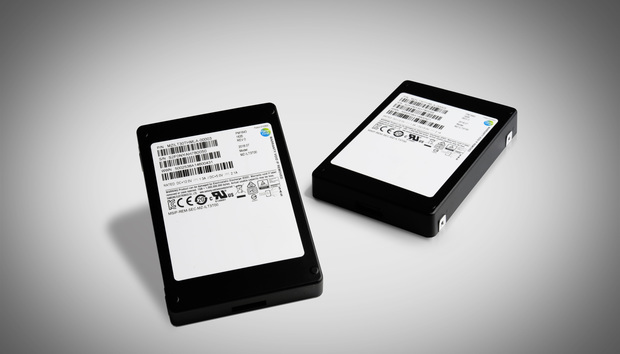 Samsung wants to put 100TB of storage into SSDs by 2020, and the company's drives are faster and more durable than competitors' because of its advantage in manufacturing, said Ryan Smith, senior SSD and storage product manager at Samsung. The 32TB SSD is the first one based on Samsung's fourth generation V-NAND flash memory, which stacks 64 NAND storage layers in one chip package. That's the highest density available in chips. The technology delivers higher sequential read-and-write performance than its predecessor, the 48-layer third generation V-NAND flash memory, Smith said. Stacking storage layers is a way to add SSD capacity as devices get smaller and more power-efficient. The layers are linked through a proprietary interconnect. Manufacturing advances have also made SSDs more reliable and durable. Samsung's 32TB SSD is faster and more reliable than its 15.36TB drive, Smith said. The company will share performance details at a later date. The SAS (serial-attached SCSI) SSD is targeted toward servers, flash arrays, and external storage systems, Smith said. The drive isn't compatible with NVMe slots, which are emerging as the new storage standard. SAS will remain dominant in the target markets for the 32TB SSD, Smith said. Companies will likely customize the SSD and controller for internal use, Smith said. The performance and power consumption of the SSD can be tweaked for cooling resources in a server and in applications like databases and analytics. Samsung also announced the new Z-SSD, which is NAND flash designed to be used as cache or temporary storage in data centers. It fits a need "between SSD and DRAM" but delivers close to DRAM performance, Smith said. These types of drives are designed for flash arrays in which data is stored temporarily while being processed by computers. The Z-SSD will provide four times lower latency and 1.6 times faster sequential read speed than the Samsung PM963 NVMe SSD, which is a high-end enterprise SSD. Samsung is also working with other companies to create a new storage form factor, which Smith characterized as a larger version of m.2 -- a standard PC SSD size -- for servers. The new form factor will provide space for more storage, accelerator chips and power control circuits. A standard m.2 SSD is 22 millimeters wide and 80 mm long, while the server m.2 standard will be 32 mm wide and 114 mm long. The new m.2 server storage standard is designed for rack servers and storage arrays.